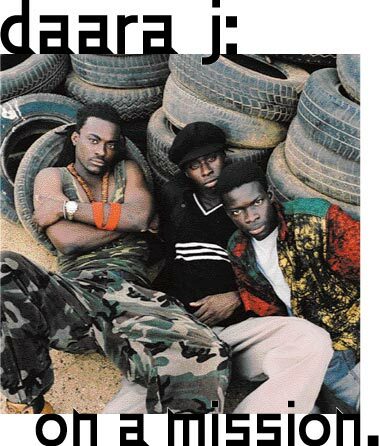 WE'RE ON A MISSION," SAYS FAADA FREDDY, A MEMBER of the Senegalese hip hop trio Daara J [photo at left], calling from a hotel somewhere in the Southwest. "The mission is to go from one side of America to the other spreading the message. And the message remains the same. We try to lift up love with conscious lyrics, to speak about Africa and how things are around the world, [about] the globalization. We tell of peace and how we can live together because there are lots of conflicts going on nowadays. We're here on behalf of the Africans to remind everybody that it shouldn't be like that. There's always a solution. Rather than fussing and fighting we should we'd better learn to live in peace and live together, because that's the only way to survive." Do you think Americans have a false impression of Africa? "Many do. That's why as Africans it's important to come over here and say, `This is how we are. This is the way we live in Africa.' We try to give 'em a vision about what's going on in Africa and report on what the Africans think about America, the give and take. A lot of people from Africa believe in the American dream, they believe once they step in here, every problem is solved. They say when they come to America they're gonna start a new life and everything's gonna be perfect. The thing is, we've seen a lot of Africans living in America, and most of them have many problems." Your song "Exodus" speaks of the immigrants and their troubles. I'm curious about some Senegalese men I've seen. When I traveled to New York City, all over there were Senegalese selling fake sunglasses and Rolex watches. In Europe they were in every large city selling designer handbags. "We call them bana bana. The Senegalese have the reputation to be a good seller and they are very patient. Even though they are only gaining $5 a day, for them it's good. They have the patience to make this money to send back home. It's not always easy. They sometimes live in bad conditions; they pack six individuals in one room, for example, in Paris. But they still hang on, even though it's hard. Some will succeed; others will not. It's part of the reality when you're on exodus. You can make it, but you can fail as well. Many times when you go abroad, the whole family will help you go, then they are back home waiting for you to send some money. Sometimes everybody has invested in someone, but he gets over here and he just forgets. In the song "Exodus" we talk about that. Why did you choose the hip hop style to deliver your message? "We have lots of influences going from the African roots to the Caribbean, the Cuban music, even the old soul music from America. Our elders, bands like Orchestra Baobab, even Youssou n'Dour used to mix these things with our traditional music. The Senegalese have always adapted. That's what happened when hip hop came in Senegal. A lot of people thought, `This music is ours, it sounds like our old tradition, like tasso, a style from the past.' So there was no difference, apart from the backing track, the sound derived from the heavy drums, drum machines and using samplers. In our country [the backing music] used to be natural with the talking drums, the natural instruments. The oral style called tasso is what we consider the ancestor of rap music. The griot spread it all over the country; they used it to speak about things like equal rights. It's something that belongs to our everyday lifestyle. It's part of our culture. That's why hip hop music is not really a big industry in Senegal, it's still a part of the culture." What role does Daara J play in all that? "In our country, there's so much to be taught. The opportunity to have the microphone is not offered to everybody. Once you have that chance, you have to be careful with the words that you say. That's why you have to talk for the voiceless; you have to talk on behalf of the people. It would be very selfish to care only about your own thing when you know that things around you are not the way they should be." Daara J performs at 3 p.m. Sunday, August 7, at Reggae on the River. The band's new album, Boomerang, was released this year in America on Wrasse Records. To learn more about the band, go to www.wrasserecords.com.